Small in Size but not in features! Garmin’s eTrex Touch 35 is a top choice companion when on the trails. Built with a 2.6” Sunlight Viewable Touchscreen Display, 3-Axis Electronic Compass and Barometric Altimeter the eTrex Touch offers 4GB of Internal Memory and a microSD card slot for the ability to add Garmin Mapping. The eTrex Touch 35 from Garmin combines the tough and rugged features of the eTrex 30 with a 2.6” color capacitive touchscreen allowing for easy data entry and search. Built with an electronic 3-axis compass with a barometric altimeter, the eTrex touch will provide more accurate elevation while showing your heading even while standing still, and without holding the GPS level. Garmin has in the eTrex Touch 35 incorporated wireless technology for receiving emails, texts, and alerts from a compatible smartphone. Also wireless connectivity to ANT+ external sensors is included. The Garmin eTrex Touch 35 comes with a high-sensitivity WAAS enabled GPS receiver with “HotFix” satellite prediction, and GLONASS satellite support for locating your position quickly and in heavy cover or deep canyons. The eTrex Touch 35 has 4 GB of internal memory for holding maps from the Garmin library of maps as well as the ability to accept a micro SD card which makes it even easier to install mapping on the GPS. 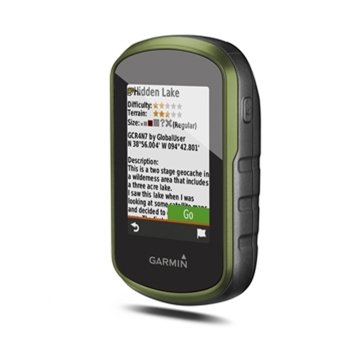 Garmin has taken care of the serious geochacher as well by pre-loading 250,000 worldwide geocaches normally found on Geocaching.com. The eTrex Touch 35 is a versatile performer that has a wide variety or mounting accessories available and an accessory map available for virtually every adventure. 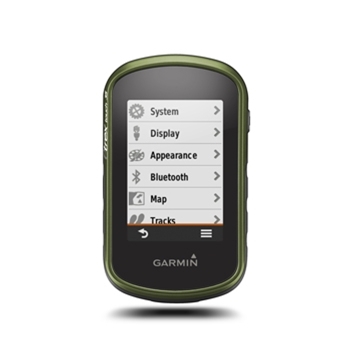 Each Garmin eTrex Touch 35 comes with:eTrex 35 Touchscreen GPS, USB Cable, User Documentation and a One-Year Warranty. Garmin’s eTrex Touch 25 builds on the long standing eTrex series with a 2.6” Sunlight Viewable Touchscreen display. Rugged and Waterproof, the eTrex Touch 25 offers GPS/GLONASS Receiver for fast Satellite Acquisition, Electronic Compass, 4GB of Internal Memory, Preloaded Geocaches and Much More!